If a ‘fan screening’ largely attended by 12-15 year old girls at Oxford’s George Street Odeon is anything to go by, the adaptation of John Green’s young adult novel is being marketed and/or received as the next big tween romance. Both Green’s novel and Josh Boone’s adaptation are largely undeserving of this label. A sensitive and verisimilar account of a teenager enduring terminal illness seems an odd candidate for launching teen heartthrobs through a romance narrative experienced vicariously by barely pubescent viewers, and although the lynchpin of the story is protagonist Hazel’s (Shailene Woodley) developing relationship with fellow cancer victim Gus (Ansel Elgort), The Fault in Our Stars is as much about familial as romantic love. Despite what the posters suggest, this is an element of Green’s book which screenwriters Scott Neustadter and Michael H. Weber maintain. As many have remarked, the film as a whole is remarkably close to its source material. In fact, the uncinematic quality of the opening scenes might lead one to question whether adapting the story wasn’t entirely pointless. In performing Hazel and Gus’ first meeting Woodley and Elgort statically deliver dialogue lifted directly from Green’s novel; so dull is the shooting here that it might as well be an audiobook. But thankfully other moments have been far more thoughtfully re-worked for the screen; Boone better utilises film’s visual capacity in positing flashback imagery as Hazel tells Gus her ‘cancer story’ in voice over. As Gary Ross demonstrated with The Hunger Games, an adaptation can be both faithful and add intelligently to its source material. This may even be the measure of a superlative film adaptation. In the medium of film The Fault in Our Stars loses the singularity of its first-person narration, and therefore Hazel’s perspective is supplemented by those of other characters. Like My Sister’s Keeper before it, the finished film flirts with the prospect of telling the teen-with-cancer element of its story from the parents’ point of view. Hazel’s mother (Laura Dern) is pleasingly developed from her rather 2D characterisation in the more Hazel-centric novel, and provides many of the film’s comic moments. The minor alterations made to Green’s narrative shouldn’t be too displeasing for fans, and make perfect sense in the context of creating a film with an acceptable runtime. The erasure of John Green’s cameo (shown after the film at this screening) is justified by his wooden acting, despite the fact that as one half of the Vlog Brothers he’s no stranger to the camera. Even incidents from the novel which are not explicitly translated on to the screen leave their trace through meticulous set dressing; Gus’ bedroom features a V for Vendetta poster and Hazel’s wall art is testament to her love of fictional band The Hectic Glow. Although the graphic device of positing texts received by the characters on screen allows for the exact replication of Hazel and Gus’ text exchanges from the book this is an irritating and uninventive technique which, as far as I know, originates from Hollyoaks. Both Woodley and Elgort excel in realising Green’s characters. The premeditated nature of much of Gus’ speech is doubly apparent in the performative medium of film, though in a filmed Q&A which followed the screening Elgort convincingly explained this as a symptom of Gus’ increased confidence after having survived cancer. 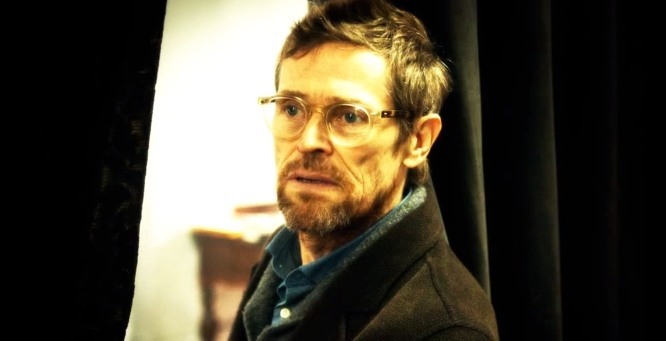 Willem Dafoe, too, is well cast as the reclusive author Peter Van Houten who Gus and Hazel visit on a trip to Amsterdam. Although setting the menace dial at a lower level than that required of him in Wes Anderson’s The Grand Budapest Hotel earlier this year, he manages a sublime blend of shocking rudeness and vulnerability. Sure to be a success with fans of the novel, Boone’s adaptation will please the uninitiated if they can see past the misleading promotional material – which apparently Guardian critic Tom Shone couldn’t. His heartstrings were affected enough for him to give the film four stars, but his shallow commentary entirely misses The Fault in Our Stars’ witty self-awareness of the generic conventions of ‘cancer movies’. In today’s film industry perhaps the only way for a young adult cancer tale to avoid tweenification is to avoid casting high-profile or classically attractive actors and not to flinch over the graphic nature of illness and cancer treatment. The squeamish should be fine watching The Fault in Our Stars, but only those with tear ducts of steel should risk entering the cinema sans tissues. If you liked this post you’ll also like The Topic of Cancer Part One and Part Two. This entry was posted in Adaptation commentary, Film Reviews and tagged Ansel Elgort, Gary Ross, Hollyoaks, John Green, Josh Boone, Laura Dern, Michael H. Weber, My Sister's Keeper, Odeon, Scott Neustadter, Shailene Woodley, The Fault in Our Stars, The Grand Budapest Hotel, The Guardian, The Hunger Games, Tom Shone, V for Vendetta, Vlog Brothers, Wes Anderson, Willem Dafoe. Bookmark the permalink.